The Hyacinth Macaw is the largest macaw and is recognized as the largest parrot in the world. They are highly intelligent and generally even-tempered birds that can make a good pet for an experienced bird owner. These birds can be loud and nippy and require a commitment of both time and energy from the prospective macaw owner. The scientific name of the Hyacinth Macaw is Anodorhynchus hyacinthinus and it is also known popularly as the Hyacinthine Macaw or Blue Macaw. There are no subspecies of this very large companion parrot. DNA testing is required to determine the gender of a Hyacinth Macaw. Hyacinth Macaws have a purple/blue plumage and a yellow eye-ring. Juvenile birds are similarly colored but have shorter tails than the adults. As the largest flying parrots, these macaws measure 35-39 inches (90-100cm) and weigh about 42-50.75 oz (1200-1450g). Their native range is in South America, specifically Bolivia, Paraguay, and Brazil. According to the International Union for Conservation of Nature and Natural Resources (IUCN), they are listed as vulnerable in the wild due to extensive trapping and habitat destruction. The combination of the Hyacinth Macaw’s size, dark blue feathers, large black beak, and yellow eye-ring creates a striking appearance. They are playful birds that love to interact with their human or avian housemates. 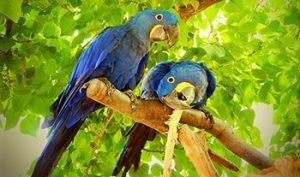 Below is a video of two Hyacinth Macaws playing. These birds can be very loud, and produce a number of croaking and screeching sounds. When roosting, these birds will yap and growl at each other, and engage in deep purring sounds. In flocks, these birds are extremely noisy. They can learn to talk but are not among the best parrot species at mimicking human speech. Hyacinth Macaws are not a good choice if you live in an apartment or in a situation where the birds can disturb your neighbors due to their propensity for making noise. What Kind Of Personality Should I Expect From a Hyacinth Macaw? Hyacinth Macaws are often considered to be a large but fairly calm species of bird. While they are indeed affectionate, their size and power make it hard for them to remain gentle. Their large beaks can be intimidating, and they have the capacity to generate 200 pounds of pressure, enough to break a finger or snap a perch. They enjoy being scratched and petted, and need plenty of toys and chewing opportunities. Hyacinths are not suitable for families with small children or anyone not confident around large birds. Though they are not generally aggressive, these birds can become stressed around the quick movements of children, and occasionally bite them. These macaws demand a significant investment in time as extended interaction with their human companions is a requirement for their mental and emotional health. If you are considering a second bird, another macaw would be the best choice since they will be similar in size. You can see more details in this news segment about Hyacinth Macaws. Hyacinths are very intelligent and have been known to use simple tools in the wild and in captivity. Guided training to alleviate screaming and destructive behaviors needs to be commenced when your bird is young in order to be successful. How Do I Care for a Hyacinth Macaw? Ideally, you should keep your Hyacinth Macaw at temperatures of around 70-80°F (21-27°C), though healthy birds can tolerate some variation. These large birds have a wing-span of four feet (122 cm), so the minimum cage size is 4Wx5Lx5H in feet (122Wx152Lx152H in cm) – see our full guide about macaw cages here. Plan on getting the largest cage you can. According to drsfostersmith.com, heavy-duty stainless-steel cages should be used as the bird’s strong beak can easily destroy less sturdy cages. Your macaw will demand more fat in its diet than other parrots, and its metabolism can handle these substances easily. Small amounts of fruits, vegetables and specially formulated macaw pellets can supplement their diet. In the wild, the birds feed on the extremely hard palm nuts, and often pick them out of cow dung where the nuts have been softened. You may need to trim the bird’s nails, and Blue Macaws are prone to an overgrown beak. Plenty of hard chew toys can help minimize this problem, but you may need to have the beak trimmed if this becomes a problem. Toys need to be provided for mental stimulation as well as beak conditioning, and your parrot will destroy many toys over the course of its life. This large bird needs plenty of time out of its cage daily or will suffer emotional strain leading to excessive screaming and feather plucking. Baths are welcome, and as you can see in the video below, your bird may well figure out how to work the sink by themselves. In the wild, molting season begins in December, but the artificial light that indoor parrots are exposed to make molting a year-round activity. As with molting, the breeding season can be at any time with macaws that are kept indoors. Hyacinth Macaws become sexually mature at around seven years of age, and in some cases, males develop more slowly and may take another year. A clutch is at most 2 eggs, and they incubate for 28 days. How Healthy Are Hyacinth Macaws? Hyacinths can live for from 40 to 50 years or more both in the wild and in captivity. They are not prone to obesity as are some other parrot species. The most common ailments are Macaw Wasting Disease and overgrown beaks. These birds are very expensive to keep and can cost well over $10,000. For that reason are often seen in zoos and not private homes, with breeding pairs often costing much more. After the initial sticker shock, the other major price you need to factor in is the bird cage. 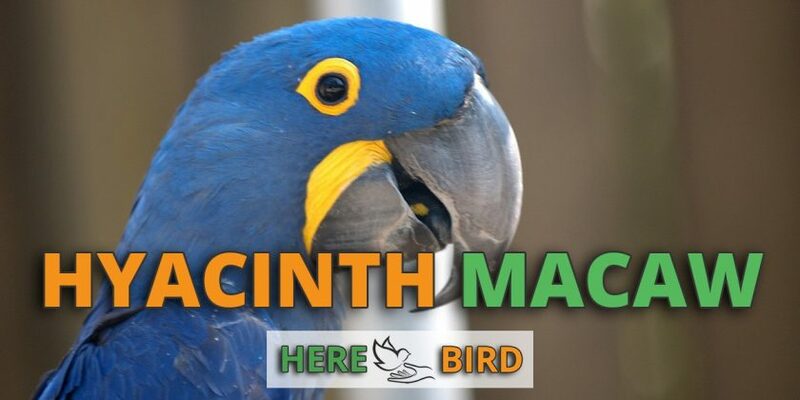 Hyacinth Macaws are the largest parrot species and they have very powerful beaks, so you’ll need a very large bird cage with thick durable bars. At a minimum, you’re looking at least $500 for a decent sized cage, but if you want a quality cage you’re looking at over $1000. A stainless steel bird cage would be the recommended choice, and these start at around $700 and go all the way up to several thousand dollars. Food costs are likely to set you back at least $40 per month for the pellets that they should be consuming. These birds eat a lot because they are so large and the pellets should be supplemented with a mixture of fruit and vegetables. Toys and shreddable items to keep your birds entertained are another consideration. Since Hyacinth’s have such powerful beaks they can easily break most toys and items in their cage and a fresh supply should be provided regularly. You could be spending up to $40 per month on new items, or you can make these for free using our DIY bird toys guide. A large backup cage for travel is also needed and you’re looking at spending at least $200 on this. Most normal travel cages just simply won’t be able to fit the tail feather of your Hyacinth. These travel cages might seem like an optional item but they are mandatory so that you can travel with your macaw to the vet in case of an emergency. Insurance and medical fees are another factor to consider and since you’re spending so much money on the bird initially it would be foolish not to invest in some form of exotic animal insurance. Perches and out of cage stands are another item that most bird owners pick up over time. For a hyacinth macaw, you’re looking at spending about $150 minimum on buying the correctly sized bird cage stand (also called a play stand). Internal cage perches can be inserted into the cage to promote good foot health and will cost you $20 to $40 per perch. Bird cage liners and cleaning supplies are the last time you’ll need to factor in. Macaws produce a lot of waste and you’ll want to do a quick daily clean of the cage to prevent the build up of smells. Supplies will cost around $10 to $20 each time you top up. 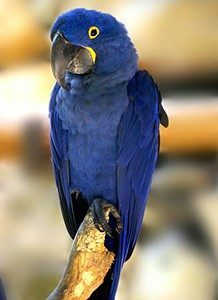 Overall, if you’re considering buying a Hyacinth Macaw then you’re going to have to be a person that has considerable wealth since this is one of the most expensive parrots available in the world. Upkeep will also be expensive and you should also aim to buy the best quality bird supplies in all of the areas listed above as well. Is a Hyacinth Macaw Right for Me? The combination of high price, potentially excessive noise and daily demands for interaction and attention make this bird a suitable pet for only the most experienced and dedicated avian enthusiast. If you do not have an abundance of time and disposable income, this bird is not a good choice as an addition to your family.